This way to Canada Line... and to adventure! 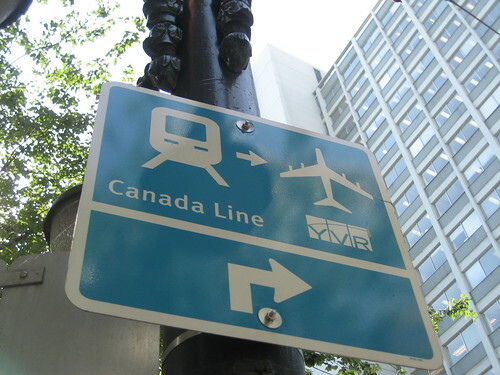 On August 17, 2009, the newest rapid-transit line in Greater Vancouver, the Canada Line, began operation. Despite the Cambie-Street-long construction headache that ensued, it’s open, and it’s changed the face of public transit in the region. One year later, to the day, I decided to commemorate the occasion by riding the line, end-to-end-to-end. I paused briefly at Broadway-City Hall, where TransLink was holding a celebration of its own… with cupcakes! The spur to the airport is one of the great benefits of the Canada Line. I’ve twice used it to take myself there so I can go fly away. And I’m definitely not alone, judging by all the luggage I see whenever I ride the line. On arriving at the end of the Richmond spur at Brighouse, I realized that this was the first time I’ve stepped onto the street at that station. For while I did a similar trip when it first opened, I just stayed on the same train before it left the station again. Indeed, I really haven’t been in that area of Richmond in a long time, so it’s quite a shock to see all the changes around me. After a quick jaunt on a community shuttle to the Richmond Olympic Oval, I made my way to Steveston. I’ve really only “passed by” the area (ie. transferring between buses), or shown up at night (Garry Point Park for an off-campus grad celebration), but never have I been in Steveston in daylight for more than a few minutes. 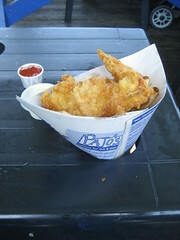 Actually, when I thought of this trip, I dwelt on only one thing: fish and chips at Pajo’s. It took a bit of walking to find it, but it was worth the wait. The food was served in an over-sized cone that kept in all the oil and vinegar and salt. Coat in tartar sauce and/or ketchup, and the experience is complete. Walking west toward Garry Point Park, I discovered a second Pajo’s outlet. It must be that good to have two locations within blocks of each other. Love it! What I didn’t really love was the lack of trees in the park. Sure, there were benches, but not of them is shaded. The heat of the day was almost oppressive, and I didn’t have enough water. I did stop under a tree at the entrance of the park to cool off. Even in the walk back toward the bus terminus, I noticed there weren’t a lot of trees on the streets, which made that walk seem longer than it really was. But I survived that, and an unexpected detour on bus route 402 back to central Richmond, to make my back to Brighouse Station, and a return trip on Canada Line to Waterfront, five hours after I left. All in all, it was a pleasant trip, and I finally got a chance to visit a part of the region I hadn’t visited before. And it was made slightly more accessible thanks to the newest SkyTrain line.